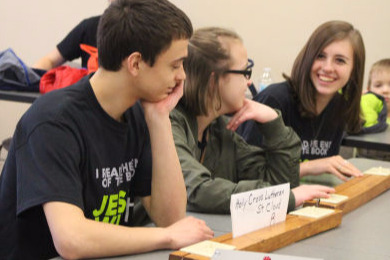 These rules are crucial to your success during the Bible Bowl games. Know them well! A game shall consist of fifteen (15) questions. Questions thrown out are not counted as one of the fifteen. In the event more extra questions are needed than the ones provided, Quizmasters are to randomly pick a question from sets in hand. Youth shall indicate the team on which they will play at registration time. There will be no changing of teams thereafter. Any church or school may enter as many teams of 4 players as they wish. A particular church or school may enter no more than three teams of 3 players each. A team for any one game shall consist of no more than 4 players with one substitute per team. Substitutes shall not be made during a game. Eligibility shall be restricted from 7th – 12th grade. Questions and judges’ decisions shall be from the English Standard Version (ESV) of the Bible. The Quizmaster will start each question with “Ready”. The team whose light goes on first has the right to answer first. A team will please wait to answer until after the Quizmaster has acknowledged their light. A team member may receive help from teammates in answering the question. Once a light has been acknowledged, the team has five seconds to begin speaking their answer. The individual speaking has fifteen seconds to complete the answer. PLEASE NOTE that only one team member is allowed to answer any given question. The first answer given will be the answer that will be judged correct or incorrect. A team, which does not begin to answer within the five-second time limit, is considered to have answered incorrectly. 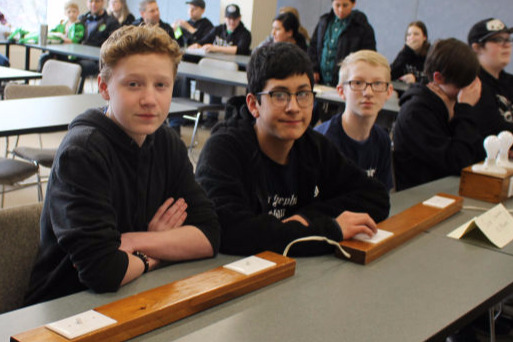 If one team answers incorrectly or fails to begin an answer within the five-second time limit, or fails to complete their answer in the fifteen-second time limit, the second team has the opportunity to answer the question. The second team is not required to answer the question. If either team fails to turn their light on within ten seconds following the reading of the question, the question will be passed. The question will be counted as one of the fifteen questions. If no light has gone on and the ten-second time limit has not expired either team may ask to have the question re-read. A question may be re-read only once. The identical time limits as outlined above apply also for the second reading of the question. Correct answers of unanswered or of incorrectly answered questions may be revealed to the contestants at the discretion of the judge. Once a light goes on the quizmaster shall immediately stop reading and wait for the acknowledged team to answer. In the event that a team switches on the light and incorrectly answers before the Quizmaster has finished reading the question, the Quizmaster shall re-read the entire question for the other team, without interruption, giving them a chance to answer. The ten second and the five-second time limits also apply. If a team member desires to challenge an opposing team’s answer with a better answer he/she may do so by immediately raising his/her hand and stating that he/she challenges the answer. A team may challenge only if they have not previously tried to answer. The appointed Quizmaster will render a decision. His decision is final. Only competitors will be allowed to voice a challenge. The Quizmaster is not to request if the other teams desires to challenge but is to move on if not challenged. The opposing team may not request the question to be re-read at this time. Cross-references, footnotes & commentaries are not a part of the Bible Bowl Competition. The team, which correctly answers the question, receives 10 points. An incorrect answer is a 3-point deduction. A team whose challenge is denied loses no points. The challenged team receives the normal 10 points for its correct answer. 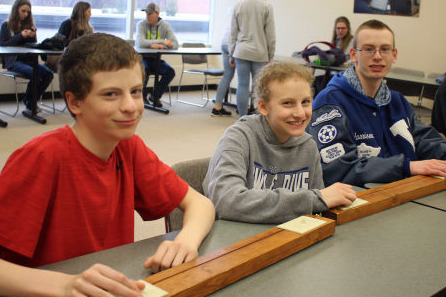 If a team’s answer is challenged and the challenge stands, the challenging team would receive 10 points for a correct answer, while the challenged team would lose no points. If after fifteen questions, there is a tie, then a tiebreaker question will be asked. Manner of scoring remains the same. The first team to take the lead is declared the winner. Being a Bible Bowl Quizmaster is a Difficult Job! Please be respectful, understanding, and forgiving as they work hard to make this event possible.